Every year the seed companies introduce new cultivars (cultivated varieties) of flowers and vegetables, promising bigger blooms, improved hardiness, better vigor, or great taste. While some advertising is admittedly exaggerated, the seed companies are generally fairly accurate when describing their seeds and plants. Simply visit the web sites or scan the catalogs of seed companies to see what’s new. Or, visit the All America Selections website to see this year’s and previous year’s winners. All America Selections are generally available at a number of different seed companies—it’s one of the requirements of winning an award. A vegetable garden doesn’t need to be food factory. And, while vegetable gardening space may be very valuable to you, consider adding some flowers to your vegetable garden. Flowers can really brighten the visual appeal of a vegetable garden, and they’ll also encourage friendly pollinators to visit. Many gardeners plant marigolds around the edges of their vegetable gardens, in hope of detracting rabbits and other pests. Consider adding a few plume celosias among your vegetables for a dramatic display of color. 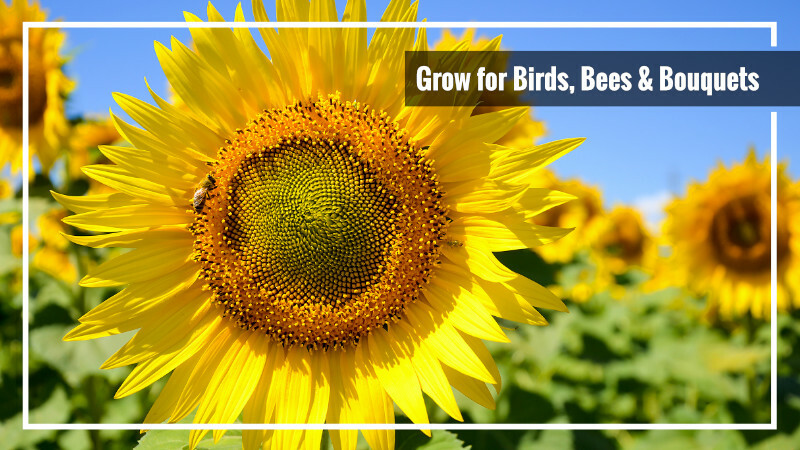 Add these pollinator-friendly flowers: asters, cosmos, sunflowers. Today’s technology makes sharing garden photos very easy. You can email you photos to friends, post them on web sites or make your own greeting cards. Of course, a few good photos are also a great record of where you planted things, so next season you’ll know where to add some flower bulbs, or plant a new perennial, without disturbing what was already planted. Many experienced gardeners don’t take the time to save some of their harvest. If you’re one of those, perhaps this is your year to experiment with preserving some of your harvest. Herbs are really easy to dry for use throughout the year; and many vegetables can easily be frozen for later use. One of our staff members routinely freezes dozens of bags of pole beans from his garden. He picks them at their peak of flavor, quickly blanches them, and freezes them in air-tight bags. Even weeks later, it’s hard to distinguish the flavor from fresh picked beans. What Are Your Garden Ideas? Do you have garden ideas that are a bit outside of the box? We’d love for you to share the little extra things you do in the garden that set you apart from the crowd. Leave us a comment and pictures if you have them or share them on our social media sites. We can’t wait to see what garden ideas you use. No List Of Bee Plants?????????????? No List Of Plants To Attract Bees.